Main sources: Dimmit, Mark, "Biomes and Communities of the Sonoran Desert Region", in Phillips, Steven & Patricia Comus, eds., 2000, A Natural History of the Sonoran Desert, Tucson: Arizona-sonora Desert Museum Press, pp. 3-18; Shreve, Forrest, 1951, Vegetation of the Sonoran Desert, Washington, D.C.: Carnegie Institute of Washington Publication 591; Brown, David, ed., 1994, Biotic Communities: Southwestern United States and Northwestern Mexico, Salt Lake City: University of Utah Press. 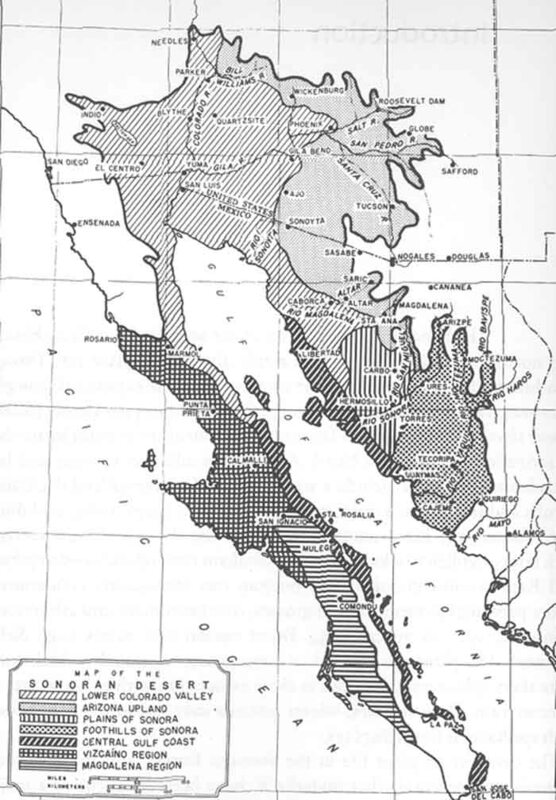 Forrest Shreve identified the Sonoran Desert, along with its major internal divisions, based on the following set of criteria. Of the four major deserts of North America (the others are the Great Basin, the Mohave, and the Chihuahuan), the Sonoran has relatively the mildest winters, which favors it over the others in species richness and variety, since freezing temperatures place even more stringent limits on plant forms than does aridity. Much of the Sonoran Desert (in particular, our area) has biseasonal rainfall, with both a summer Monsoon (involving localized thunderstorms) and gentle winter rains -- though, this being "desert", both patterns are highly variable. For example the winter season of 2001-2002, calculated from October 1 through April 30 [note that different authorities define this season differently-- this is our definition], brought only 1.5 inches to a rain station in Cascabel, AZ, compared with its local average -- based on 20 years of records -- of 7.81 inches.Thanks to Harold Elliott for these local records.) Since the Sonoran Desert rarely receives frosts, its plants and animals are largely of tropical origin, and their numbers of species and variety of communities are by far greater than those found in the other three North American deserts. Indeed, parts of it are considered by some researchers to be better described as "Thornscrub" -- characterized by "an irregularly layered overstory between 2m and 8m in height," "typically composed of spinose, microphyllous, and succulent plant life-forms" (Brown, ed., cited above, p. 100). For an introduction to the Flora of the Sonoran Desert (and its Arizona Uplands subdivision -- our area), see San Pedro Valley Flora: Today (and the further links contained therein). To go directly to a list of species considered characteristic of the Arizona Uplands subdivision of the Sonoran Desert, see Arizona Uplands.